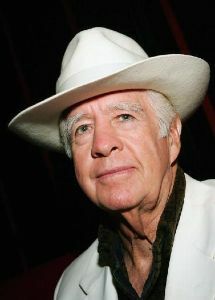 2008 November : Clu Gulager's Birthday is approaching, he will be 80 years young this month. As a child he got his nickname from his father for the clu-clu birds who were nesting at the Gulager home at the time Clu was born. As he grew up Clu served in the United States Marine Corps & was stationed at Camp Pendleton from 1946 to 1948. After the Marines he started out as an actor at the age of 19. He learned his skills at an experimental theatre in Paris under the guidance of actor Jean-Louis Barrault. He then signed up with Universal as a contract player. Gulager played Billy the Kid in the 1960 NBC television series The Tall Men opposite Barry Sullivan as Pat Garrett, and played "Emmett Ryker" from 1964 to 1968 on another NBC series The Virginian starring James Drury, along with more than sixty other roles in film and television. He starred in the 1964 version of The Killers. Over the years to follow Clu became a big star for his roles in horror movies such as The Return of the Living Dead, The Hidden and The Offspring etc. He also had a keen interest in Directing , Producing & Screen Writing. Gulager is the father of film director John Gulager (contest winner in third season of Project Greenlight) Clu has appeared in his son John Gulager's film Feast as a shotgun-toting bartender. Clu will be forever remembered for his roles in Westerns & Horror Movies. Copyright �2008, Clu Gulager.com . electronic or mechanical, without the proper permission of Clu Gulager.com .